Yes, you read it correctly. Said actually believed that. What planet did he live on? His proposition is literally the exact opposite of the truth. When you criticise Islam, the Koran or Mohamed, the whole world seems to tumble down upon you. Or, more specifically, people are killed, assassinated, riots ensue, places are bombed, etc. Worse that that, academics like Said himself come to defence of Islam, the Koran or Mohammed. And they do so without question. Not only that, but the state, the courts, journalists, Leftist parties and councils get in on the act. 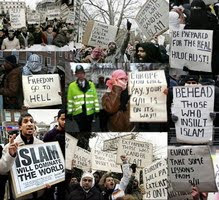 They talk about ‘hate speech’, ‘Islamophobia’ and pass laws to stop people criticising Islam, the Koran or Mohammed. How many bombs go off when someone criticises Judaism and Jews? How many riots are there? Does an ‘offence’ against the Jews get fiercely debated in the UN or anywhere else for that matter? (No. Offences are made against Jews in the UN!) No! No - to all these questions. In fact, far from it being the case that criticism of Judaism or the Jews is ‘unacceptable’, it is in fact de rigeur in left-wing and academic circles. You are often ostracised if you don’t criticise the Jews…. sorry, the Israelis/Zionists and their religion of ‘the chosen people’ and their God as a ‘real estate agent’. On the other hand, Islam is treated as if it’s the greatest and fluffiest religion going by people who twenty years earlier had not given it a moment’s thought. So that’s what I and many others are doing wrong. We aren't studying Islam correctly. In order to study Islam correctly we must read Nietzsche, Marx, Freud and the numerous post-Nietzscheans, post-Marxists and post-Freudians. No wonder I was getting it all wrong. God knows what academics did before Marx. God knows what academics have been doing without Marx, Freud and the post-Marxists and post-Freudians. At least now Said has told us through which prism he saw the Islamic world – the Marxist or post-Marxist prism (no doubt, with little other bits and bobs thrown in for padding). Edward Said seemed to dispute that Israel is ‘the Middle East’s only democracy’. Either that or it has ‘been used as a foil for Islam’ (4). If he did dispute it, then he was wrong. If he didn’t dispute it, then a state’s being ‘the only democracy in the Middle East’ is a very good reason to use it as a ‘foil against Islam’ or even a foil against Islamic or Muslim states. Democracy is a very good thing to have when you are surrounded by Muslim countries and are the endless victim of countless Hamas, Fatah and Hezbollah attacks and suicide bombs. Unless, as I have said, Said said ‘the only democracy in the Middle East’ ironically - because it is not a true democracy. Is that because Said believed that the Arabs in Israel aren’t full citizens or was it something else to do with Israel’s Arab population? Or was it because if Israel’s democracy is a capitalist liberal democracy, then it is not a true democracy? If that's the case it must be because Said’s position was some kind of far-leftist or even Islamist position which views capitalist liberal democracies as not real democracies. They are examples of, say, ‘class power’, ‘hegemony’, or something like that. I think that it is very likely that Said did mean it (mainly) in the second sense, and not because of Israel’s treatment of Arabs. However, the treatment of Israeli Arabs and its democracy tie in together in Said’s account. In that case, Israel’s treatment of Israeli Arabs will no doubt be a consequence of capitalist, liberal democracy. Then again, the Arabs do have the vote, they can sit in the Knesset, form anti-Israeli political parties, publish books calling for the destruction of Israel (sometimes with Jewish publishers), etc. The treatment of Israeli Arabs cannot in and of itself make Israel a bogus democracy. In that case, even if Arabs have the vote, can sit in the Knesset, etc. that would still not make Israel’s democracy a real or genuine democracy. And Said, being a Marxist of sorts, or a post-Marxist of sorts, was almost bound to take this position. Thus Said might well have preferred various Arab states to the Israeli state. After all, many far-leftists once preferred communist Russia to the US or UK. Why can’t Said have preferred Egyptian or even Pakistani 'democracy' to Israel’s democracy? In fact one likely candidate for a better regime, and even a better democracy (though not a parliamentary democracy) for Said was Iran in the early days of the revolutionary regime (perhaps also later). Perhaps he preferred Iran’s system to Israel’s when writing this (in 1982 and 1996). Chomsky, for example, thinks that the US is a ‘Nazi state’ which needs to be ‘denazified’. It will not be surprising, then, that Said too thought that Israel was a Nazi state which needs denazifying. In fact he did. He saw Israel as being in many ways fascistic or Nazi in nature (as do virtually all Leftists today). Which states floated Said’s boat or did he see as at least being superior to Israel – even if he was not completely happy with any non-Israeli regime? He wasn’t completely happy with Arab Muslim states either. That had nothing to do with their democracies or a lack thereof, but because, like all the Islamists and terrorists today (as with many 'revolutionaries' in the 'spring Revolutions'), he thought that most Arab regimes were American stooges and deeply corrupt. But mainly: they were not Islamic enough. That has nothing to do with democracy as we know it. It was because these states were far too secular and hadn’t implemented sharia law across the board. But surely a purportedly non-religious ‘post-Marxist’, Edward Said himself, could not have thought that! Yes he could! Just as Chomsky preferred Maoist China and even Cambodia to the system of the US, then it is very likely that Said preferred, say, Iran or Pakistan to Israel or even to the USA! As I said, Chomsky still believed this even though he modestly admitted that Mao’s China, Pol Pot's Cambodia, etc. were not perfect. Said also admitted to the failings of Muslim Arab states. Yet he still preferred them, maybe all of them, to Israel. Did he prefer them to the US and the UK too? If that was the case, it was quite an incredible thing to believe. That Iran or even Pakistan is superior, even if not perfect, to Israel? It is also incredible thing that Chomsky preferred Cuba and Maoist China to the US and, of course, to Israel. Such extreme positions do indeed exist. There were many Leftists who once supported the Soviet Union, Maoist China and even North Korea. The Trotskyist Socialist Workers Party recently stated that it would support Iran in a nuclear war with the West. Thus Said preferring the Iranian or Egyptian system to that of Israel is quite possible. How could a purportedly non-religious person even cope, let alone defend it or see as superior to Israel and the West, a totalitarian Islamic state? These are the possibilities or realities we have to understand if we are to make sense of Said’s position on Israel and his position on ‘Western capitalist states’. This must be an important component of any explanation of Said’s attitude to Israel vis-à-vis Iran, Palestine and possibly all Arab and/or Muslim state. Said could of course have rejected every system or state on the planet and thus his expectation that Israel should be perfect would have made at least some sense. Yet he didn’t out rightly reject all states, even if he did criticise all of them. He preferred and supported particular Islamic or Arabic regimes against the US and the West. Trotskyist groups also argue than no state is ‘a true socialist or communist state’. 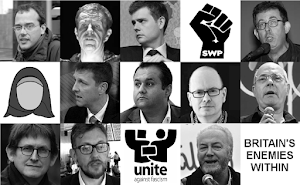 But they too take sides in wars or non-violent ideological confrontations, as I just said in the case of the SWP supporting Iran against the West. (This is just a bad as Bradford Pakistani Muslims preferring Pakistan or Afghanistan to the UK’s system and setup.) Said too took sides. He obviously took the sides of the Arab nations against the West. He even supported Saddam Hussein in the Second Gulf War and the Iraqi regime's attempts to nuke Israel in the 1990s.